Comments Off on Our 2016 Century 21 Centurions and Award Winners! I’m sure by now you’ve heard the great news about CENTURY 21… We are the brand that has swept the 2014 J.D. Power Home Buyer/Seller Satisfaction Study! Read all about it in the official press release below. MADISON, N.J. (August 6, 2014) – CENTURY 21 Real Estate, the iconic brand with the world’s largest real estate franchise sales organization, announced that it has been ranked highest in overall customer satisfaction by the J.D. 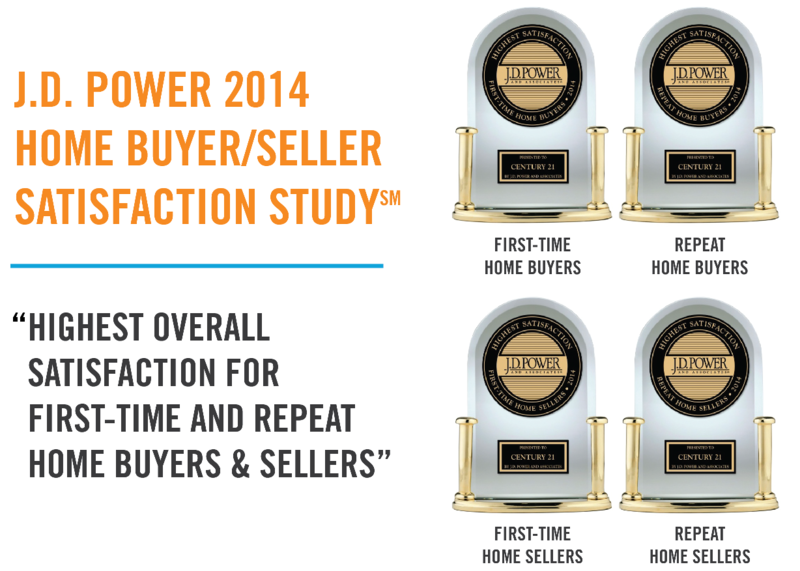 Power 2014 Home Buyer/Seller Satisfaction StudySM, released today. Specifically, CENTURY 21® Real Estate swept the awards by receiving the highest ranking among national real estate companies across all four customer satisfaction segments in the study, including: First-Time Home-Buyer Satisfaction, Repeat Home-Buyer Satisfaction, First-Time Home-Seller Satisfaction and Repeat Home-Seller Satisfaction. As the 2014 Winter Olympics in Sochi, Russia are getting underway, CENTURY 21 Real Estate LLC is debuting the newest SMARTER. BOLDER. FASTER. television ads starring our greatest asset: the relationships we have with our clients. These ads will run throughout the games, but will be especially prominent during the bobsled competition. No wonder, since Century 21 is the official real estate company of the USA Bobsled and Skeleton Federation. The TV spots highlight the fantastic relationships we build with our clients and as visual metaphors feature a Zen garden, a field of puppies, and crowdsurfing. Don’t take our word for it though, take a look for yourself. International real estate grows in prominence and importance with every passing year. Several of our neighborhoods are attracting thriving communities of expats who live, work, and play in a world class metropolitan area. When you live in a region with an economy last measured at $442.4 billion, larger than Austria’s, South Africa’s, or the United Arab Emirate’s, you see a lot of folks from around the world coming to do business or settle down. This works in reverse as well, travel to any global metropolis from Sao Paulo to Shenzhen, and you will see Texans winning friends and influencing people. Texans in general have always welcomed opportunity no matter where in the world it comes knocking. This is why we are excited that CENTURY 21 has revamped and released an industry leading international real estate search. If you are looking to buy real estate in any one of over 71 countries where there is a CENTURY 21 System member, then let us connect you to them through our global referral network. Just want to see what’s on the market down in San Miguel Allende, Mexico? Now you can. Here is what President and CEO of Century21 Real Estate LLC had to say about the new global real estate search portal.